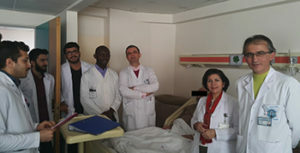 From right to left: Prof. Recep Aygul, Prof. Serefnur Öztürk, Dr. Hakan Ekmekci, Dr. Leonard Ngarka, medical students, and Resident Dr. Azer Mammadli, during ward rounds. I was delighted when I received the news of my selection for the WFN-Turkish department visit program in October 2016. It didn’t actually take place until Feb. 18, 2017, due to visa procedures. I am grateful to Prof. Alfred Njamnshi and Prof. Serefnur Öztürk, as well as Burak Tokdemir, who facilitated my visa acquisition. I arrived at the University of Selcuk, University Faculty of Medicine in Konya, Turkey, on Feb. 17, and immediately settled into my accommodations. The next day, I was warmly received by the staff of the Neurology Department under the leadership of Prof. Öztürk, who presented the service. I was handed a detailed program for my stay there. Each working day ran from 9 a.m. to 5 p.m., with a break between noon and 1:30 p.m.
During the four weeks, I spent each day from 9 a.m. to noon seeing patients hospitalized in the department, including those in Neurointensive Care. For the first week, the period from 1:30 p.m. to 5 p.m. was spent in outpatient consultation with the different consultant neurologists, and we received 18-25 follow-up cases and six to eight new cases per day. This exposed me to the manipulation of recent drugs and protocols in the management of patients with neurological disorders. 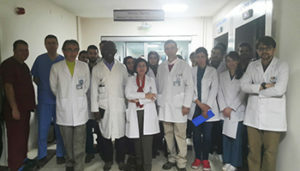 Selcuk University Faculty of Medicine, Neurology Department team, including all staff in front of the Neurology Department (in-patient service). The remainder of my afternoons were spent in clinical neurophysiology labs: EMG, EEG, and polysomnography labs for the second, third, and fourth weeks, respectively. I carried out nerve conduction studies on patients who came during this period and did a good number of needle EMGs. All of these were conducted under the supervision of Prof. Recep Aygul and Dr. Hakan Ekmekci. My participation in the EEG sessions has improved my reading and interpretation of EEGs, especially video and sleep EEGs. During the last week of my stay, I had introductory lessons on evoked potentials and polysomnography, of which I did a few and assisted in their interpretation. I participated in several staff meetings with other departments, including with neuroradiology and interventional radiology specialists to discuss cases of carotid artery stenosis; with endocrinologists, and ear, nose, and throat specialists to discuss the management of patients with sleep disorders; and with the department of psychiatry. There were other presentations in the department among residents and students, and I made a presentation on peripheral nerve disease and entrapment neuropathies. My experience in Turkey was exceptional, and the memories will last long. It was an exposure to up-to-date science, to culture, and a challenge to pursue excellence. This visit has significantly impacted my clinical practice. I have adapted some of the protocols from Konya (Parkinson’s disease and other movement disorders) in patient care back here in Cameroon. I am presently assisting in doing EMGs in a hospital close to ours in order to continue the training and keep the skills I acquired. Even though insufficient infrastructure, equipment, and drug availability remain a major setback in Africa, one thing stands: quality training is the bedrock for research and quality patient care and development on this continent. This visit has contributed to improving the quality of my training. 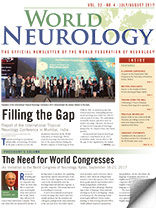 I wish to express my heartfelt gratitude to the World Federation of Neurology, the Turkish Neurological Society, and the Neurology Department of Selcuk Medical Faculty for giving me this opportunity. I wish to thank Profs. Öztürk and Aygul, Dr. Ekmekci, and the neurology residents and staff of this department for making my stay memorable.